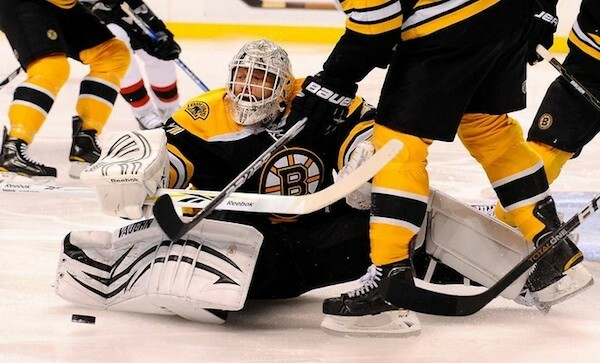 Boston Bruins goaltender Tim Thomas needs no introduction, especially to InGoal Magazine readers. The only thing documented more than the Vezina Trophy victory two seasons ago has been his return to trophy-winning form this season after surgery to repair a torn hip labrum that was so bad that he called himself a “one-legged goalie” last year, causing him to lose the starting job in Boston to Tuukka Rask. 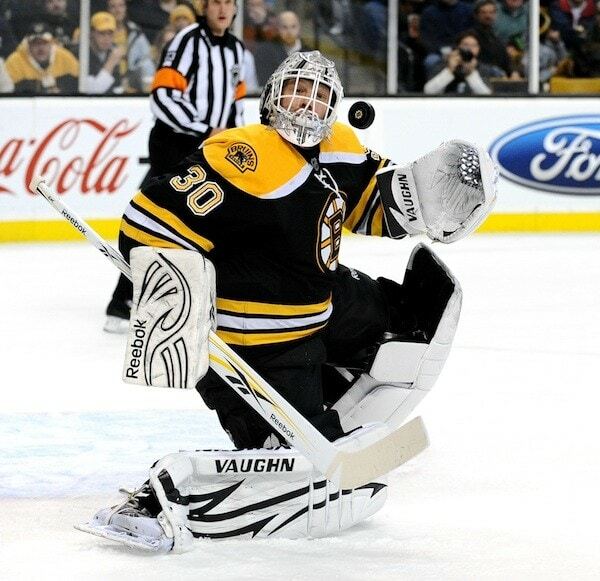 That led to a lot of doubting from observers who quickly questioned whether anyone who played as unique a style as Thomas could be consistent, but as the Bruins’ veteran has proven over and over again throughout a career he was close to contentedly ending in Finland more than half a decade ago, doubting Thomas is never a good idea. Here at InGoal Magazine, we’ve preferred to talk about all the unique things that help him thrive, from how a deeper skate sharpening and changing the cage on his mask have made him a better goalie this season, to how Yoga helped him identify and get through the hip injury and win the Vezina two seasons ago. There are no shortage of good stories about Thomas, from selling apples door to door in Michigan with his dad during harder times, to breaking all his new sticks from Team USA after being a late cut from the World Junior team, to bow hunting bears in the summer. But most of all he is a passionate goaltender, one that has always been gracious with his time for InGoal Magazine, even answering questions over email once on the team flight back from a game in Montreal. 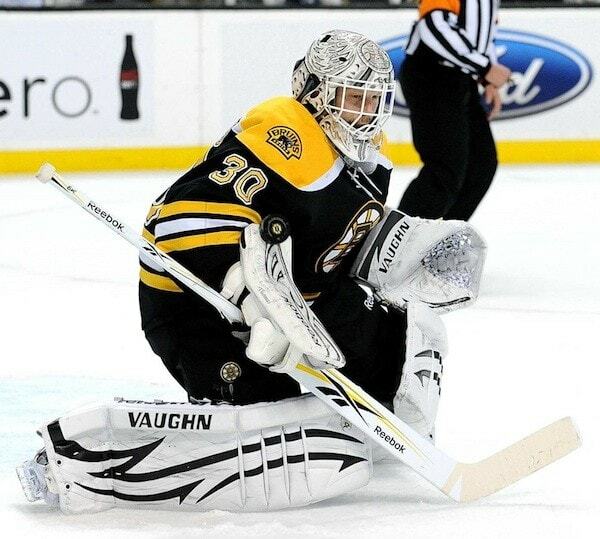 We’ll start with InGoal subscriber Adrian: “Dear Tim Thomas, Being a Bruins fan I remember when Tuukka took over for you last year and many I talked to thought you were done, possibly for good. What game has meant the most to you so far this year? “I think you need to learn the technique and you need to practice the technique, but when it comes game time you have to do whatever it takes. Even in practice. You do the goalie drills in practice and work on the technique and then in the game you will use them when necessary. But then the rest of practice you don’t want to just get scored on while practicing technique all the time. You need to find a way to stop it, and play a little street hockey. “Technique can help you move more efficiently, but once you are in position if the shot is going somewhere away from your body you have the have the ability to move your legs or move your arms. I’ve seen a lot of kids that have great technique but they turn into robots and it’s like their arms are glued to their sides and they don’t have the ability to throw a shoulder, or whatever it is. You have to be able to move out of that technique mode when need be. “That’s not a bad thing. There was no butterfly technique until I was 23 and at my first pro camp, and Jacques Cloutier in Colorado, he was trying to pound it in to my head and make me learn it, and at the time I didn’t like it because I was a pretty good goalies as it was. But it didn’t take me too long to realize the benefit of some of these things and I spent my whole rookie year, whether I was in the East Coast, the IHL or Finland – because I played in all three leagues that year – every practice, before practice and if I had the energy, after practice, I was practicing the techniques for proper movement. ~ You still use proper leg recovery more than you used to, though, right? 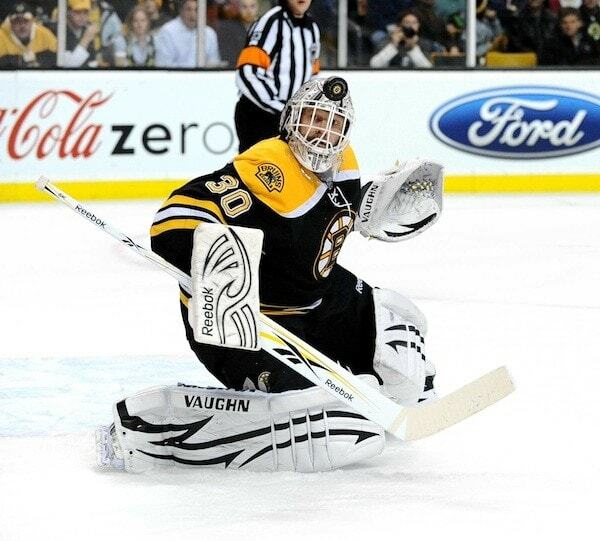 ~ InGoal got almost a dozen questions about the gear Thomas wears, most of which had to do with his frequent switches among brands, or why he had mixed and matched this year, something reader Mitch Cayouette wanted to know about specifically: You’re using a Reebok blocker and a Vaughn catcher and pad, Is there a reason why you are doing so? The larceny Blocker are you just trying it out, or is it more protective or comfortable? “Going into this year I just decided to basically wear the gear I felt more comfortable with, it doesn’t matter about the brand. 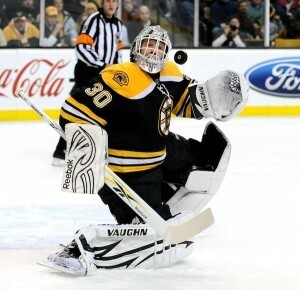 And I really like the Reebok blocker. I have a Vaughn that, to be honest, I haven’t really given a fair chance because I just feel so comfortable with the Reebok. I have two, one has lasted me the first 50 games and just in the last couple of games I have been wearing the second one. ~ Does the way it seals the ice in paddle down function in decision as well? 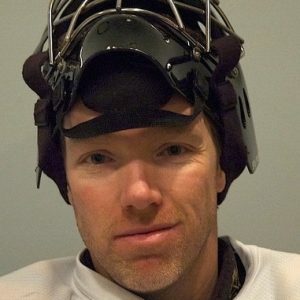 ~ More questions about equipment – and the propensity to switch brands over the years – from Scott Christensen of Wauwatosa, WI, who says he “currently use Smith and you wearing them helped convince me to try them,” and Darin Ledwith, and Jason Ryan, who asks: What exactly do you look for in a set of pads? ~ InGoal Magazine newsletter subscriber Matt writes: Pleasure to have the opportunity, Tim … Can you tell us how ‘tight’ you strap your pads? P.S. I’m a Hab’s fan, but my money’s on the Bruins winning the Stanley Cup this year based on your play this season thus far. ~ Dave Snipes asks if there are any other mods done to your equipment and why? “As a kid you grow up using the vertical bars and through college, so I was using vertical bars until age 23, so when I decided to go back and try it, it was an easy adjustment. It felt comfortable right away because I had already spent 18 years with the vertical bars. The cat eye, obviously, straight ahead you got great vision, but when it gets on its way into your body, I’ve always found that you lose the puck a little bit as it is getting really close to your body. It’s only like two or three feet out where you lose it and the puck ends up going into a jumble of bars there. ~ We’ve seen goalies suffer concussion-like symptoms with how hard players shoot these days, has that ever been a problem for you? ~ And the final question goes to Mitchell Wiznuik, a 12-year-old goaltender in milton Ontario, who writes: I’m a AA goalie looking for a way to improve my Game to a AAA effort but how do I do that? And how do I get noticed? Thanks for the pic of Thomas’ strapping. 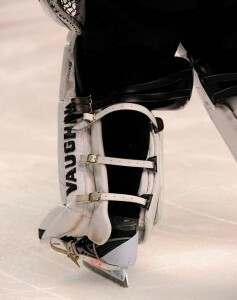 I see he doesn’t have velcro straps… and I’ve just got confirmation that’s it’s okay for a goalie to tape their ankles! 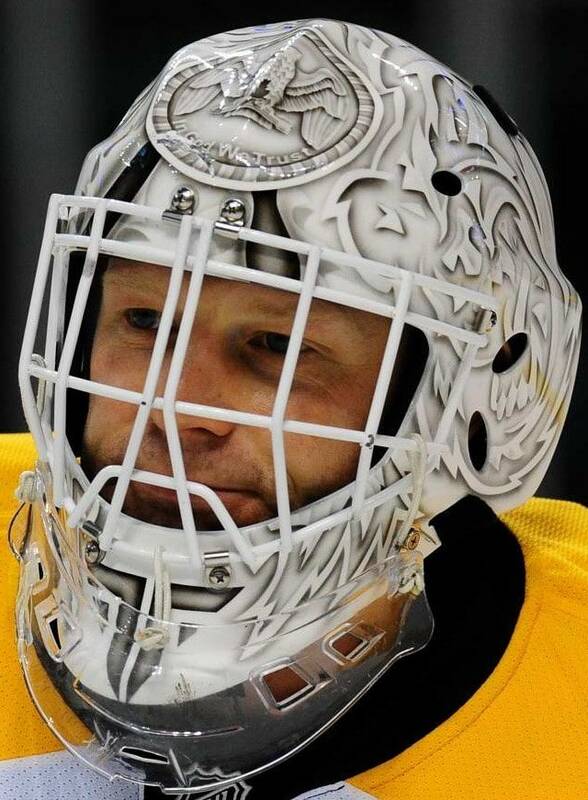 I think TIm Thomas deserves a special thank you for being so generous with his time and wilingness to share info. Maybe that comes from all the detours he took before making it to the big league. I really like the comments about the smaller goalie having to learn to be more patient and read the play better before going down. 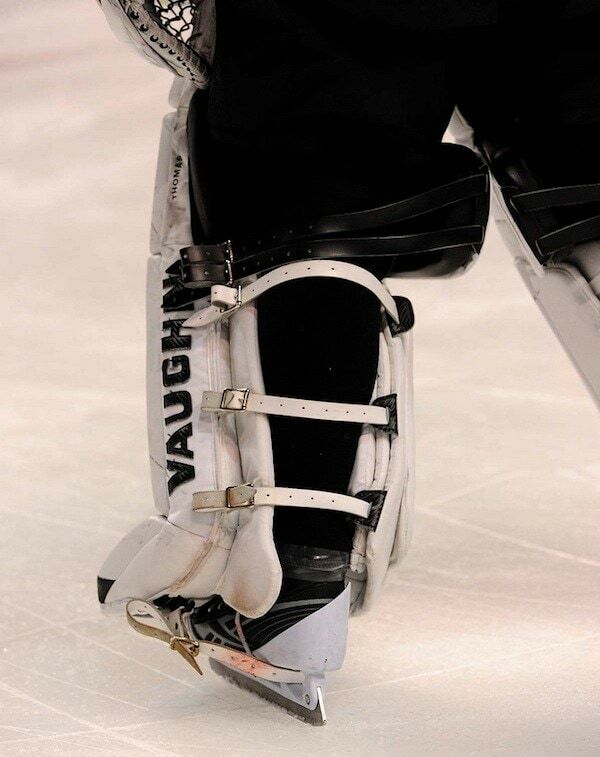 Many of the young goalies I watch and or coach are trying to play a style that they are about a foot too short for (blocking style on almost everything). Sometimes when young goalies grow quickly (i.e.10-12 year old), they take on that blocking style too soon and when the shooters catch up (often by bantam) they can consistently pick the high corners on a goalie who uses the butterfly too soon. 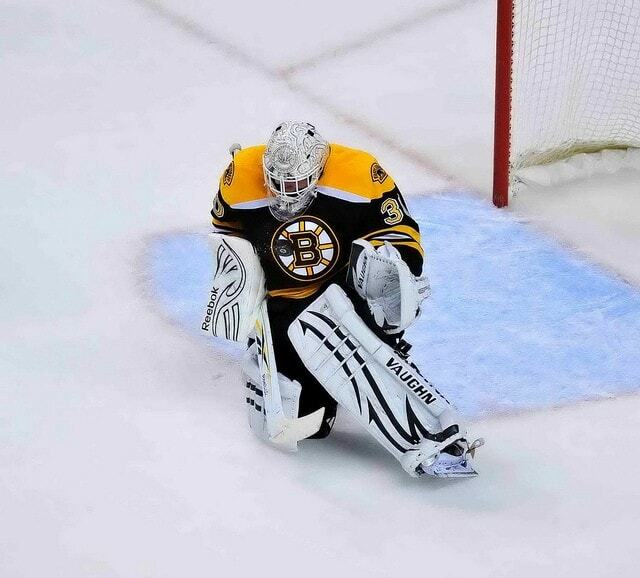 By the way, can anyone tell me whether Thomas uses X blades or Step blades on his skates? If you look at the close-up picture of his skate in one of the previous Ingoal.mag articles (head to toe, dec. 8) the blade seems rather tall. I have these baldes and find them to be amazing for how much faster and more efficiently I can pick and push. And they only cost about $80 (vs X-Blades’ $180!). I also recommend the FBV (Flat Bottom V) cut, cut at 3/8 or 1/2. These blades, and that cut, take away having to ‘think’ about your blades: you simply react and get your desired reaction. I got step blades too- they are really amazing. As you said- no more slipping. Plus my skates stay sharp for much longer. The only problem is that they get loose at the heel where the third bolt has play in it. It makes a clicking sound but otherwise doesn’t seem to be a problem yet. I’m a young goaltender and I’m looking for my first equipment. I’d say I’m halfway between a butterfly and hybrid. Does anybody know what pads I’d be most comfortable in? I’d appreciate it! Plus, are there different types of C/A builds, ie. for butterfly, flybrids, reflex, etc.? were could get the best goalie stuff. Hey, lookit that, I predicted the Bruins to win Stanley.